Anne Hughes and I recently finished co-leading a wonderful tour of the eastern Avalon Peninsula and Terra Nova National Park, organized by Eagle Eye Tours. We spent a great few days birding with six guests from Switzerland, Hungary, Texas, Illinois and Ontario and shared some of our island’s amazing scenery and fantastic birds. After a short two-day break, I begin another 10-day tour tomorrow for Massachusetts Audubon (organized by Wildland Tours). Our Eagle Eye Tour group, flanked by a beautiful vista in Terra Nova National Park. Despite a little rain, we started the tour with some mid-afternoon birding around St. John’s … Black-legged Kittiwakes trolled around the harbour, while Great Black-backed, Herring and Ring-billed Gulls loafed at the marina. Yellow & Yellow-rumped Warblers serenaded us in the rain, and some Cedar Waxwings dropped in to check us out. After supper, we enjoyed great looks from above at a Bald Eagle and her chick on a nest near Signal Hill, then listened to American Bittern, Wilson’s Snipe and a fabulous Sora (very scarce in Newfoundland) calling at Lundrigan’s marsh in the northeast corner of the city. What a great start to the week! Our first stop this morning was Cape Spear – the easternmost point of land in North America. Morning fog added a little magic to the experience, even if it shrouded the scenery. However you see it, the hillside leading to the cape certainly didn’t disappoint. Northern Waterthrush and Fox Sparrows rang out their songs from the treetops, a Pine Siskin posed at eye level right next to the road, and a pair of Pine Grosbeaks gave everyone the point-blank looks we had all been hoping for. Even a Snowshoe Hare hung around for our entertainment, while a Moose loafed alongside the road on our return drive. The fog lifted just in time to produce a fantastic afternoon for our boat tour of the Witless Bay Ecological Reserve. 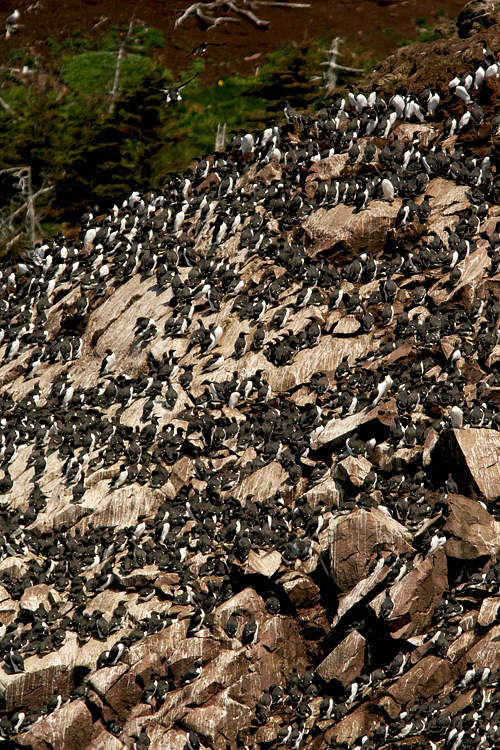 It was a show-stopper to say the least – thousands of Atlantic Puffins fluttered off the water and dotted the grassy hillsides, and we had up close and personal looks at oodles of Common Murre, Razorbill, and Black Guillemots as we cruised along just metres from their cliffside roosts. We even spotted one of the few Thick-billed Murres known to be nesting on majestic Gull Island. And despite all the amazing birds, our attention was drawn away when four Humpback Whales appeared out of nowhere and put on quite a show. On our way back to St. John’s, we stopped to bird some wooded roads and trails in Goulds – snagging good looks at beautiful birds like American Redstart, Swamp Sparrow, and Tree Swallow. The highlight, though, was a Great Horned Owl sitting on a nest with two chicks. We enjoyed distant but excellent views through the scope in order to disturb it as little as possible. By far our harshest day in terms of weather, our spirited group made the best of blasting winds and periods of heavy rain as we toured the “Irish Loop” on the southeast Avalon Peninsula. We started the morning by scoring great looks at a cooperative little Boreal Chickadee – a key target for all of our participants. A Yellow-bellied Flycatcher emerged from its thick cover long enough for everyone to enjoy a few looks, and a spritely Wilson’s Warbler flicked in for a quick visit. Another major target of the tour was scored a short while later on the road to Cape Pine – a total of three Willow Ptarmigan were seen as they flushed up and flew away. Two of us braved the harsh winds and rain to walk across the barrens and were rewarded with more flight looks, while another eventually landed on a nearby ridge and trotted around in full view for a van full of very happy birders! Although only seen by half of the group, a Whimbrel flushed from the roadside enroute to Cape Race was another highlight – quite unexpected in June. We managed to find a family of Canada Geese, three drake Ring-necked Ducks and a group of Greater Scaup on ponds along the way – waterfowl that are not always easy to see during the breeding season. We even lucked into a group of Common Eider off the very tip of Cape Race, a species rarely seen this far south in summer. We added a few mammals to our trip list with Gray and Harbour Seals, as well as a very lucky Mink that successfully ran across the road in front of our vehicles. 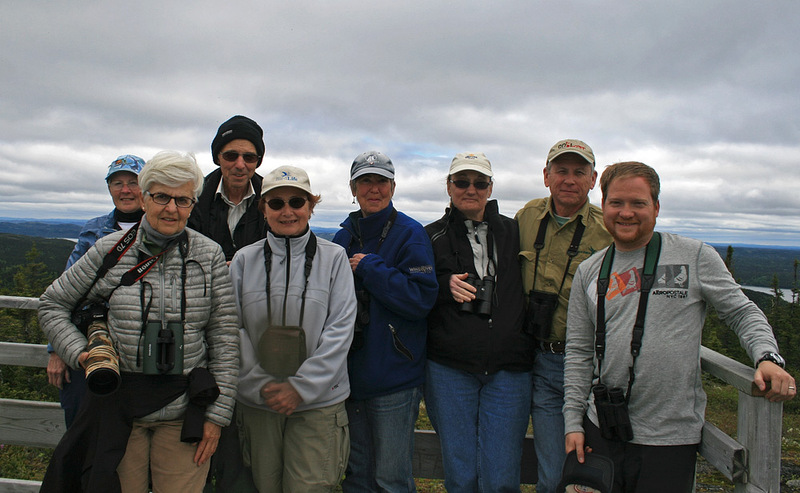 Try as it might, the weather was unable to dampen our day – the entire group was thrilled with great birds, breathtaking scenery, and a tour through some of the most historic communities in Newfoundland. Then we all warmed up with great food and drinks at a pub in downtown St. John’s! 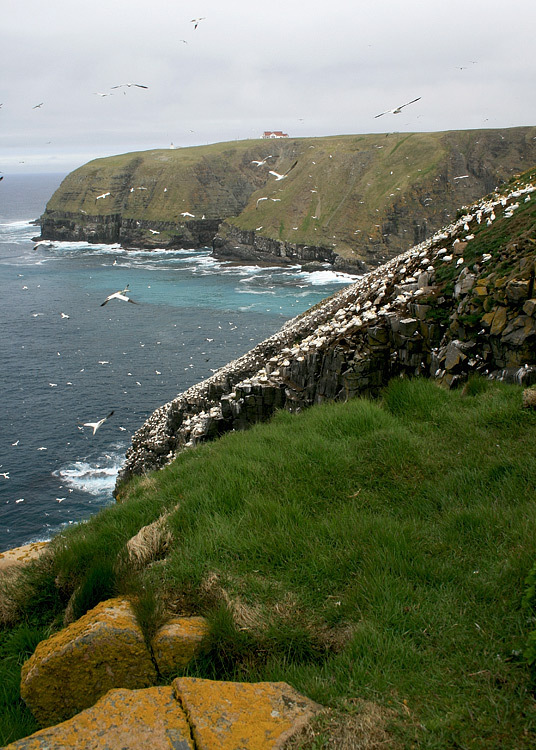 One of the most anticipated days of any summer tour in Newfoundland is a visit to Cape St. Mary’s – home of the third largest (and most majestic!) 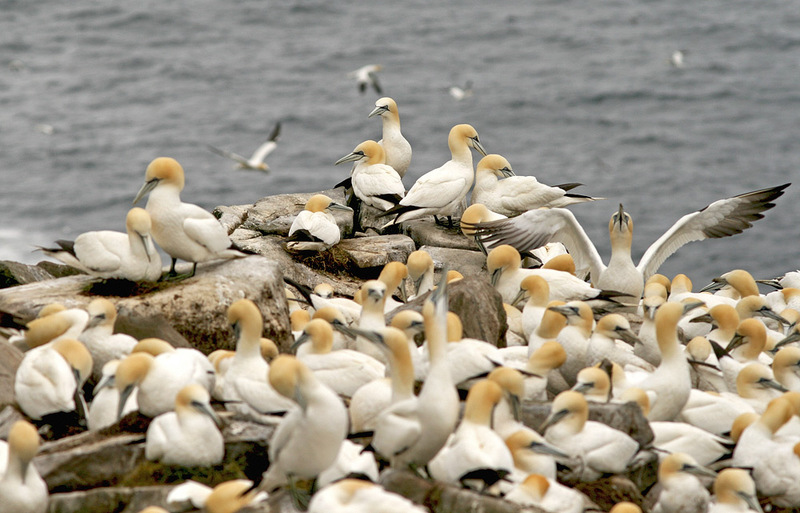 Northern Gannet colony in North America. The weather turned our way, allowing us to enjoy clear views of the amazing cliffs and vistas, and beautiful looks over “bird rock”. 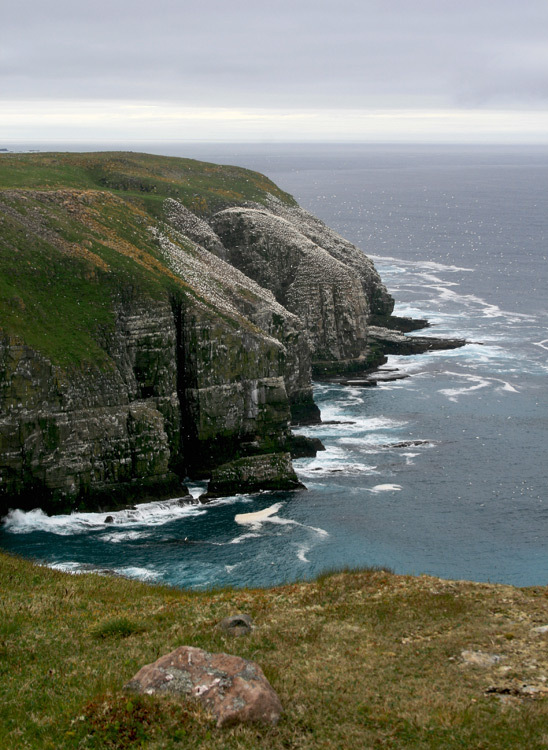 We also enjoyed dozens of Thick-billed Murres at their most southerly breeding location on the continent. Thousands more Common Murres and a handful of Razorbills clung to the cliffs along the cove, and a Great Cormorant posed on a rock below. A highlight of the morning was Northern Harrier displaying on the road to the cape, dancing in the sky. Several more put on an aerial show as they swooped around and chased each other over the coastal barrens. Horned Larks filled the air with their flute-like songs, while American Pipits displayed along the seaside trail. A quick stop during our drive north along the “Cape Shore” produced a real surprise when I heard the haunting song of Grey-cheeked Thrush echoing down a ravine. 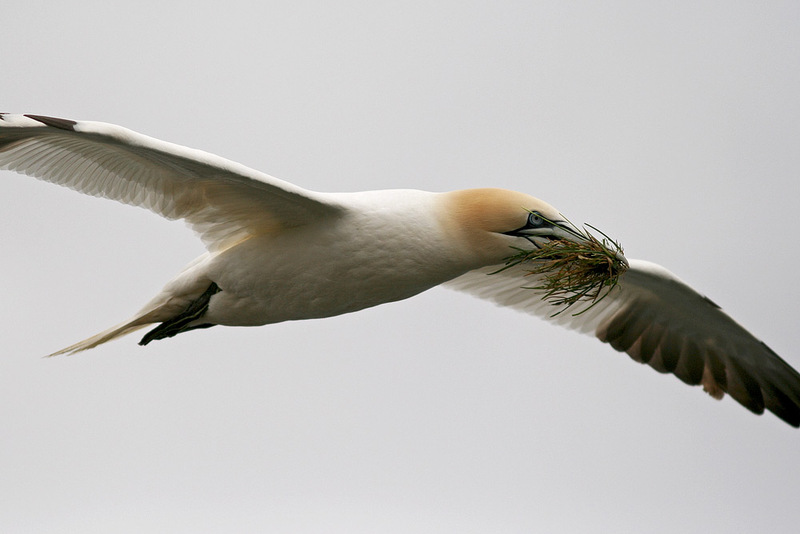 This bird has seen significant decline across its breeding range and is now considered a “threatened species” in Newfoundland & Labrador. Although it was a prime target for our group, we had no known place to find them. 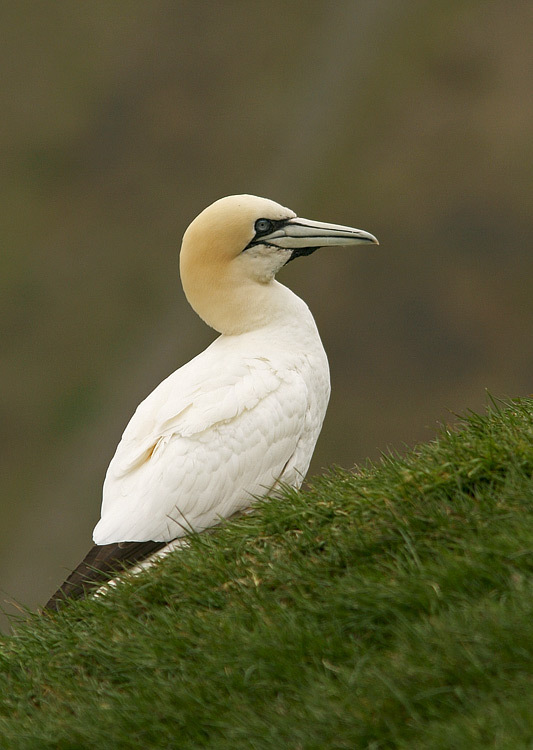 Not only were we delighted to discover TWO singing in this area, but we were ecstatic that everyone eventually got to see one as it flitted around and sang from a hillside perch. After arriving at Charlottetown in Terra Nova National Park, a few tireless souls took a late evening stroll. Those of us that wandered the woods across from the motel were rewarded with a Ruffed Grouse, as well as our first Black-throated Green Warbler of the tour. We all collapsed after a long day. 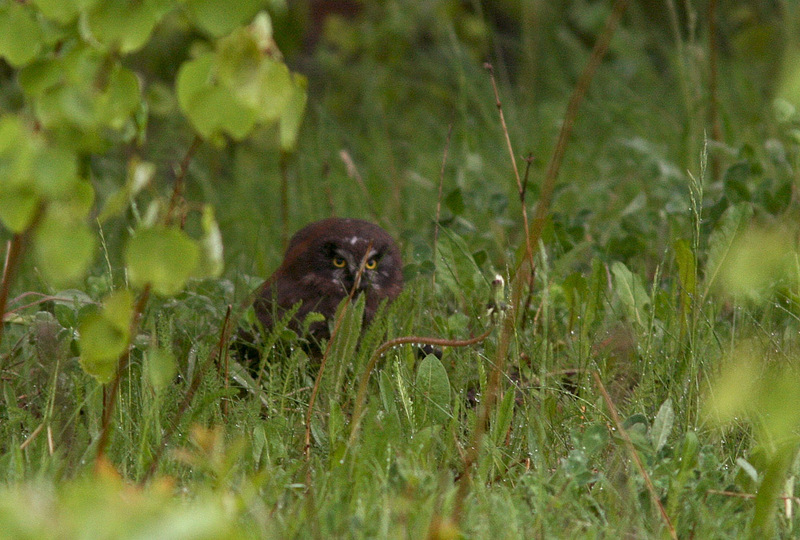 This fledgling Boreal Owl was a real surprise, and rather “cute” as it popped around in the grass, looking at times like a ball of fluff. Our morning started off with a real bang … While waiting for us to emerge and begin a pre-breakfast bird walk, one of our participants (Mike) discovered a fledgling Boreal Owl sitting on low tree branch right in the motel garden. We roused the troops (even those who weren’t planning to make the early rise) and the entire group got to enjoy this very unexpected bird. After a few minutes it decided to pop down in the grass, attempting to fly and entertaining us as it eventually hopped away into the cover of the forest. What a treat!! The early birds continued on our walk to enjoy the morning chorus – birds like Hermit Thrush, White-throated Sparrow, and Purple Finch combined their voices to make for some interesting music. 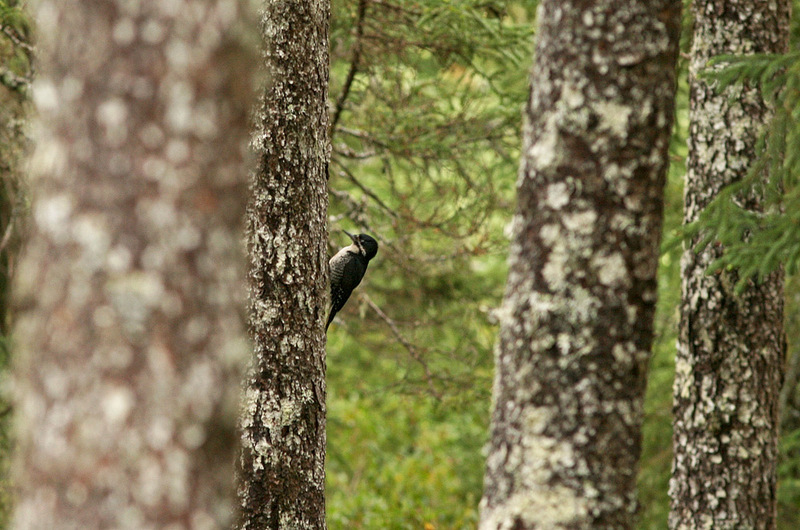 This male Black-backed Woodpecker played a game of “peek-a-boo” with us as it fed among fallen trees. Our first official outing of the morning took us on a beautiful hike along Dunphy’s Pond trail. The flies were bit thick, but our resilience paid off with not one, but two, Black-backed Woodpeckers. We had great looks at a male first, then found a very vocal female a few hundred metres further. Fantastic!! When we reached our turnaround spot at “Juicey Pond”, our first Lincoln’s Sparrow popped into view. It made us hang around just long enough to catch two Gray Jays as they passed through, pausing briefly to check us out. Another great score!! We continued birding at various locations throughout the park, racking up birds like Common Yellowthroat and Magnolia Warbler. We even found some beautiful Pink Ladyslippers in bloom at the top of Blue Hill, where we all enjoyed a beautiful vista over Newman Sound. 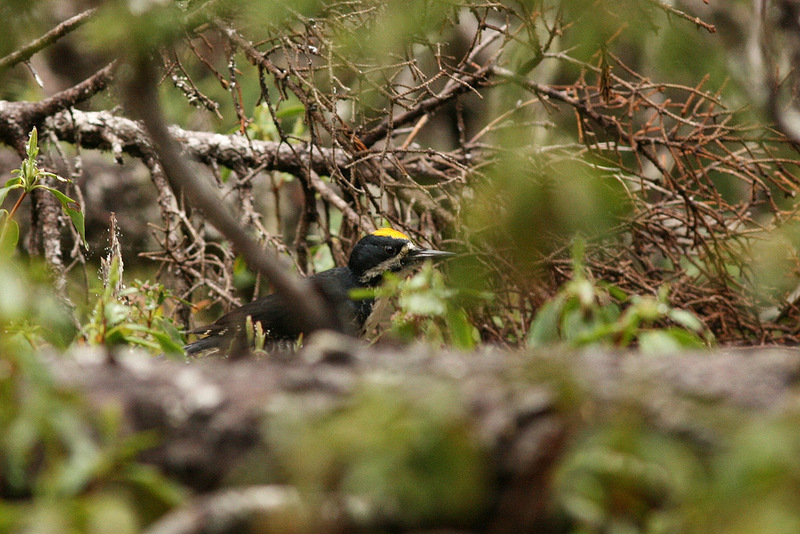 On the drive back to St. John’s, we found a Rusty Blackbird “singing” at a roadside marsh – another threatened species that has seen worrying decline across its breeding range. A female Black-backed Woodpecker was being very vocal, suggesting a nearby nest. Some of our participants left early this morning, but three joined us for one last morning of leisurely birding around St. John’s. We started with a stop at a city marsh where we saw a stunning drake Wood Duck – an uncommon species for Newfoundland. We also stopped by Cape Spear in order to enjoy it without the fog of our previous visit. Our last new species for the trip was an Alder Flycatcher calling and flitting around at Mundy Pond. It was a fantastic few days, spent enjoying some great birds with a great group of people. That’s why I love this job!! We ended the tour with an excellent tally of 88 species, and each of the participant rhyming off a big list of highlights. A few were even talking about coming back – in winter!! 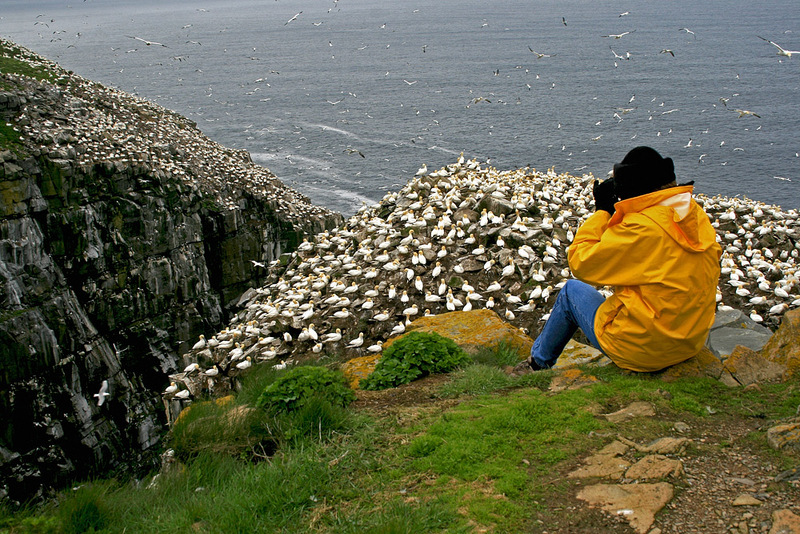 That’s the magic of birding in Newfoundland. I’ve been doing very little birding the last little while, so not much to write about. I did make two trips to Portugal Cove South in search of a Tundra Swan that has been hanging out down there – coming up empty both times. Tundra Swan has only been recorded a handful of times in Newfoundland, and only twice in recent decades. 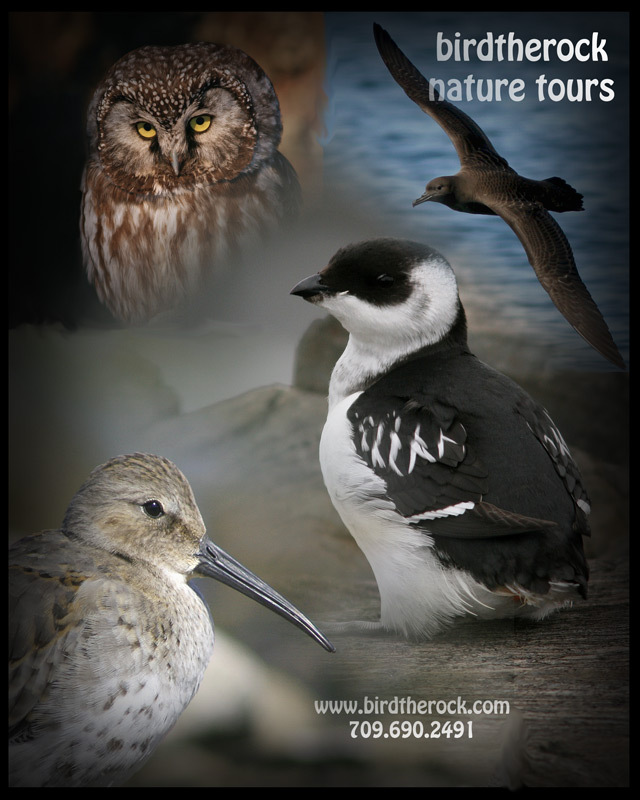 So, on a somewhat bird-related note: I was recently asked to donate a day of guided birding to a charity auction for the Newfoundland & Labrador Brain Injury Association (I serve on the Board of Directors – a position clearly more related to my academic life than to my birding!). I wanted something eye-catching to place on the auction table rather than a simple black & white certificate, so I tried out a couple new Photoshop techniques to put something together. The result is a simple collage of four of my photos taken in different seasons here on the eastern Avalon … text on the back of the collage will serve as the certificate for the auction winner. Let’s hope it draws at least a little interest! In other news, I’m starting to prepare for two back-to-back tours I’ll be leading later this month – one for Eagle Eye Tours, and another for Wildland Tours/Massachusetts Audubon. I always look forward to these tours – its a great way to meet interesting people, share the wonderful nature of my province, and get paid to do what I love most. Not a bad deal!